This is actually an interesting question from a game design perspective - is fairness anti-fun? Can it be possible for a game to be "too fair" and "too balanced?" Is forcing some players to play at a disadvantage - for example, in DOTA2's safelane vs hardlane mechanic - a good thing or a bad thing? There are some clear disadvantages to DOTA2's chaotic lane strategies - with the lack of communication in pubs, everyone has at some point ended up playing a melee hard carry forced to go into the hard-lane solo against 3 enemy heroes and gotten absolutely crushed through no fault of their own - such a thing would never happen in LOL. This aspect of gameplay has both been proclaimed as its greatest strength and also greatest weakness - in DOTA2 when you get crushed, you really get crushed, and many losses at low level play stem from your team composition, not the individual skill of the players. While in LOL, people complain that every match more or less plays out the same way, with little variety in strategy and team composition making it stale. LOL has a stable strategy because many of their gameplay elements are symmetrical. Ability Power (AP) and Attack Damage (AD) carries both scale into the late game. Given you have two carries in the game, you would always get one of each type to force the enemy team to get an inefficient mix of magic resist and armor stats. Mid lane is given to the AP carry, because in general AP carries are easier to gank - mid lane is the shortest lane and thus the safest for them. Also, the blue jungle buff is relatively close by. Typical mid lane champions are Ahri, Annie, Brand, Lux, Orianna. Where does the AD carry go? The Support champion will accompany the other carry, given a choice between top or bot lane, we find the bot lane is the superior choice because the Dragon pit is there. In the early to mid-game, most of the game will focus around the Dragon, since Baron is not an option yet, so it is better for your duo lane to be there. Typical AD carries are Ezreal, Vayne, Corki. Typical supports are Thresh, Taric, Sona. Top lane will thus be 1v1, and generally the Bruiser or Tank type champions will go there. They need to be tanky, because they need to be able to hold the lane on their own – they are a long way away from any help. Typical bruisers are Renekton, Nassus, Vladmir, Tryndamere, Shen, Jarvan, Zac, Elise. And finally, there is always a jungler, because it’s difficult to translate a 2v1 advantage into a large enough XP and Gold advantage to offset the disadvantage of losing a jungler. Generally, a team which sends 2 heroes top or mid will “win” those lanes, but still end up behind the other team who is running a jungler when comparing total gold and exp. Typical junglers are Jarvan, Elise, Lee Sin, Cho Gath. Because the lanes are symmetrical, each team’s composition will exactly mirror the opponents they are facing in the lane. So in a nutshell, this is why the champion composition and laning strategy is the way it is: it’s achieved a local maximum, any change to this composition makes it worse off. Virtually every game you play in LOL will follow this formula, unless you are top tier team experimenting with unusual strategies to throw your opponent off their game, or you get a rebel in your team wanting to try something new and isn’t afraid to be scolded by their teammates for breaking the meta. Why is the DOTA2 metagame so unstable? 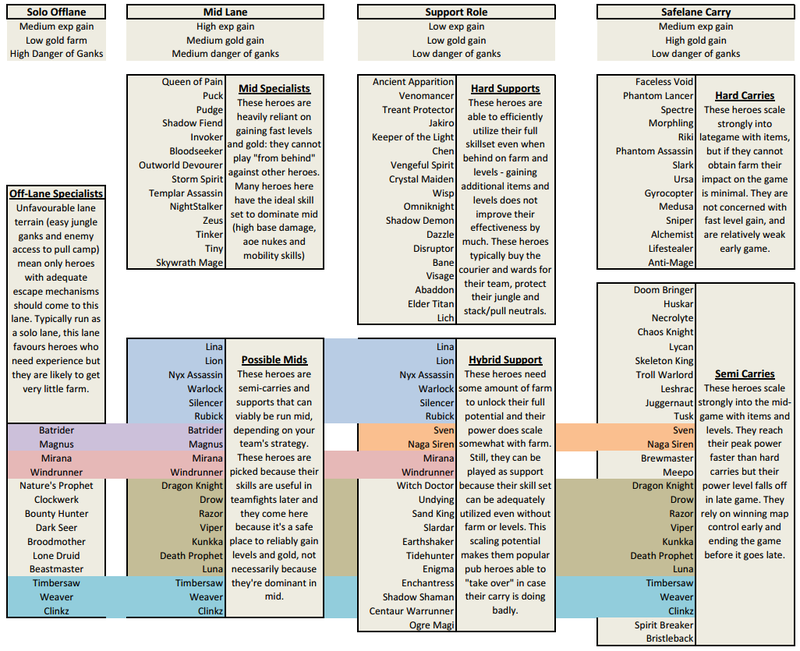 DOTA2’s map and game mechanics have a number of asymmetrical attributes that allow “either/or” decisions by the teams. Usually game designers aim for symmetry because it’s the easiest way to ensure the game is balanced, but asymmetrical gameplay elements can create an unstable metagame and allow a variety of viable strategies to exist at the same time. 1) Asymmetrical map – in LOL, the map is perfectly symmetrical - the terrain features don’t favour either side during the laning phase. However, in DOTA, the map has what is called “rotational symmetry”. Each side lane has terrain that favours one side over the other, so the top lane is the Dire easy lane and the Radiant hard lane, while the bottom lane is the Dire hard lane and Radiant easy lane. This creates an unfair matchup that teams need special strategies to handle – teams can either allocate more resources / heroes to the difficult lane to ensure they win it, or they can allocate less to the lane to ensure the impact of losing it is smaller, or run balanced lanes which can adapt to the enemy’s strategy. It’s very rare for carries to face off against each other - the carries typically go to their respective safelanes to get farm, which are on opposite sides of the map. 2) Asymmetrical scaling – In LOL both AP and AD champions scale with items so there is no advantage to running an all AP team or all AD team - you mostly end up using one of each. In DOTA2, the hero scaling is asymmetrical - Intelligence heroes get no spell damage scaling and tend to peak earlier in the game, but Agility heroes tend to peak later and harder with items that increase physical damage. Teams can choose to either run teams with more early game heroes (to win early) or more late game heroes (to win late) or to build a balanced team which can adapt to the enemy’s strategy. 3) Runes on mid – In DOTA the 2 minute runes form an important part of the strategy, offering powerful temporary boosts and regeneration (from refilling the bottle). Mid lane can either be run LOL style by placing a hero with poor mobility there for safety but giving up the runes, or it can be run as an aggressive mid by placing a hero with strong mobility to contest the runes and use them to gank the side lanes. 4) Amplifying asymmetry - Deny mechanics and creep pulling / jungling– In DOTA2, if the enemy lane presence is weak enough, players can use these mechanics to further dominate the lane they are in. Denying creeps reduces the experience and gold the enemy obtains from the lane, and creep pulling further boosts your lane gold while completely stopping enemy experience gain for a time. This is why junglers are optional in DOTA2 – it forces one of your lanes to play at a disadvantage, and this exp and gold disadvantage can be larger than the gold and exp your jungler is generating while jungling. There can be anywhere from 0 to 3 junglers in a DOTA2 game (defensive jungle, offensive jungle, and ancient stacking). Creep stacking also allows supports to sacrifice their farm to create jungle stacks for carries, amplifying their farm, allowing teams to run anywhere from 1 to 3 carries - such a redistribution of income is not possible in LOL, where typically your bruiser, mid and ADC can all obtain a high amount of farm every single game. 5) Limited Vision and Teleports - in DOTA2 there is a limited amount of observer wards available - typically only 2 up on the map at any given time - and the Smoke of Deceit consumable allows heroes to pass under wards undetected anyway. This means that it’s much harder to protect a hero against ganks if the opponent really wants to commit to it, preventing stalemate scenarios where the map is well warded enough that neither side can disrupt the early game farming phase of the other. It also raises the stakes when one side manages to deward even one or two observers - it means they know the enemy has literally no vision on the map for several minutes, giving them temporary map control. Overall this means is that if the opponent wants to disrupt your strategy, they usually can if they devote enough resources to it. At the same time, the existence of teleport scrolls allow any hero to teleport to another tower within 3 seconds - which means that if one of your lanes is getting dived, your team can always decide to send help - it's just a matter of how much resources you want to devote to it - yet another either / or scenario to choose from. Even if you successfully stop the gank, the total gold and exp you lose by leaving the lane could leave your team worse off. As a cool final fact - the positioning of Roshan (the equivalent of Baron - his name, Nashor, is a homage to the original Roshan in DOTA) heavily favours the Dire team, and this plays out in competitive statistics - of all Roshan kills at pro level gameplay, 66% go to the Dire team. However, the Radiant / Dire winrate is nearly equal, at 50% plus minus 1%. This means the asymmetries in the rest of the map - of which there are many - must be offsetting it almost exactly. For example, Radiant mid can be pulled and Radiant ancients can be jungled at level 1. Every one of these factors force a team decision that could go either way – what sort of heroes to pick, how many heroes to allocate to which lane, what type of mid to use, whether to utilize a jungler or not – leading to a multitude of possible lineups. Very broadly, each of the 3 lanes yields different levels of experience and gold income and exposes your hero to varying levels of danger, and this affects the suitability of different heroes in each lane. Mid specialists like Puck or Queen of Pain scale a lot better with experience than with gold - hence they are typically put in the Mid lane. Being a short and safe lane it’s unlikely they can be harassed out of experience range even by 2 or 3 heroes, guaranteeing them solo experience gain and allowing them to be the highest level on the map. Mid heroes generally want AOE skills to clear waves, mobility skills to contest runes, and high base damage to out-last hit their opponents. The sequence of play revolves around clearing the creeps to push the lane just before the 2 minute rune respawns so you can safely pick up the rune (and recharge your bottle) without wasting exp and gold. This leaves the enemy in a catch-22 situation, where if he tries to contest the rune he loses a full wave of experience and gold, yet if he doesn't you'll eventually force him to leave the lane due to the extra regeneration you're getting by bottling the runes. There are also heroes which can’t contest runes and generally “lose” mid but go there anyway - for example Nightstalker, or Drow who don’t have AOE clears or mobility skills. They still lane mid anyway and take the loss because they need a safe lane to gain quick experience for their powerful ultimate they will use to dominate the enemy later. These heroes rely on being higher level than their opponents - they can't "play from behind". There's also a third class of heroes who can go mid, like Outworld Devourer or Bloodseeker who have such superior last-hitting power that it doesn't matter that they can't contest the runes, they win by denying the enemy gold and experience. Hard carries like Faceless Void and Anti-Mage scale a lot better with gold than with experience - hence they are typically put in the Safe Lane Carry position. Their supports will defend them against enemy harassment, allowing them to get a lot of last hits, however the presence of supports in the lane reduces their experience gain. The supports will typically be also engaged in pulling the camps (to gain exp / deny exp to the enemy) and warding the forest to prevent ganks and stop their pull camp from being blocked. They typically buy “farm accelerators” like Midas or Battlefury as soon as possible, and then spend some more time farming one or two major items before they’re ready to teamfight at about 35 minutes in. There are also Semi-carries like Juggernaut or Razor who are drafted into teams who want to win with an earlier timing - they may directly buy a teamfight item like an Aghanims or BKB and take the fight to the enemy. If the enemy team had a hard carry who bought a farm accelerator instead, they will be in a weaker position for awhile until they catch up. Off lane specialists like Bounty Hunter, Mirana or Windrunner have abilities which allow them to solo the dangerous off-lane even against multiple enemies. Like mid specialists, they also scale a lot better with experience but have even less reliance on gold. In the off-lane, they can usually stay within experience range of the creep wave to gain relatively quick levels but it’s likely they won’t be able to get much in the way of last hits. They typically need to ward the enemy pull camp and jungle area to stop the pulls and to protect themselves against ganks, and they may bring sentry wards themselves to counterward. Heroes like Nature’s Prophet and Lone Druid can also go to the offlane, because their summons can manipulate the enemy creep wave (dragging them to your tower through the forest so you can farm them safely) and also block the enemy pull camp. Because of the asymmetry of the map, it’s a foregone conclusion that you will “lose” the lane, it’s just a question of “by how much”. Against skilled opponents it’s considered a victory if you can block their pull camp (making sure their supports stay underlevelled) and you manage to eke out some levels in the off-lane before moving into the midgame. The offlane solo lane may not be viable depending on the number of disables on the enemy team - it’s not uncommon for the offlane solo to abandon their lane and find farm in the jungle or try to be useful elsewhere. Supports are a “catch all” term for the other heroes in the game without a defined role and lane. There are hard supports like Crystal Maiden or Shadow Demon who can perform well even when behind on levels and farms relative to their opponents, and will typically be tasked with ganking, warding and pulling / stacking the jungle. Stacking deserves a mention here - neutral creeps respawn every 1 minute if their spawn box is empty. By attacking and dragging the creeps away from their spawn box at the minute marks, you can create larger and larger creep camps. These can be used to deny entire waves of your own creeps by pulling them to your friendly creeps, or you can simply grow the stack size for your carry to farm later if he has an AOE skill. On the other hand, pulling creeps into an unstacked camp will not kill your creeps, but only delay them while you kill the neutral camp - this creep wave will now join up with the next upcoming wave, so now you have two waves of creeps marching together towards the enemy tower at once. This is an effective way of making a strong push on the enemy tower. Support heroes are very active in the early game moving around the map and exert a great deal of influence on how safely their carries can farm, how safely their team pushes, and how well your team is protected in ganks (supports are typically the ones to teleport in to stop a gank). There are also initiator supports like Tidehunter or Sand King who need early farm to get a blink dagger for initiation. There are also jungling supports like Enchantress or Chen, who primarily gain gold in the jungle but can exert pressure on the adjacent lanes by ganking it repeatedly. And there are Roamer supports like Vengeful or Spiritbreaker, but they have currently fallen out of favour in 6.78 (though they may be making a comeback in 6.79). So this is a handy chart I've made - personal opinion only and based on what I've seen work in competitive games - of which heroes tend to play which role. 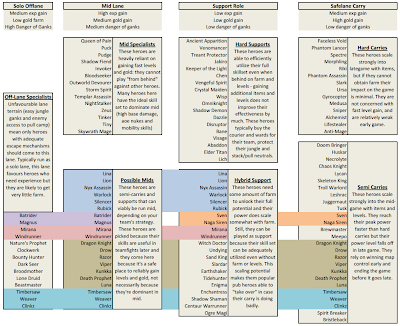 Click through to see the full version - I've added colored sections to indicate heroes which can play multiple roles. (direct link) Inevitably the placement of some heroes can be controversial, for example I've labelled Sven and Kunkka as a semi-carry when they are able to one-shot the entire enemy team late-game with sufficient farm which is more than most hard carries can achieve... and Slark is in the wrong place, he's a Semi-carry, not a hard carry....I'll probably update the chart as time goes by. Within the constraints of the mechanics described above several popular laning setups have come to be in popular use. (notation is x-y-z from Radiant side corresponding to hard lane - mid lane - easy land). This splits the farm up most equally, and your team plans to contest all 3 lanes. This is the most common “non-strategy” used in the majority of lower skilled public games. The safelane support can be a jungler, turning it into a 2-1-1 plus a jungler. 2 supports and a carry on your safelane virtually guarantee your carry gets every single last hit, however, the opponent’s carry in their safely will likely be farming unopposed as well. Your two supports can leave via your jungle to gank mid once you’ve forced the enemy offlaner away, also putting the enemy mid in constant danger. This is the most common “non-strategy” used in the majority of high skilled public games. This setup is very flexible in terms of junglers - a single safelane support can also be a jungler, and the offlaner can also abandon their lane if it’s too dangerous and transitions into a jungler as well, making it a 0-1-2 setup with two junglers. A 1-1-3 Defensive Trilane can transition into a 1-1-1 Tricore lineup if the enemy abandons their offlane, freeing up the two supports to jungle (to boost their exp and gold gain) or roam at will. 2 supports and a semi-carry head to your offlane to challenge the enemy carry and deny their farm. This is an aggressive and early game oriented composition that is an asymmetrical counter to the Defensive Trilane - the enemy will be picking a “safe” hero with typically poor scaling to go in their offlane, which you will beat 1v1 with a greedier semicarry solo like Clinkz or Weaver, and your offensive Trilane setup should beat their Defensive Trilane as your semi-carry in the hardlane is active from the start while their carry only comes online 20 minutes in. Also, if the enemy does not expect this, they may mistakenly ward your jungle (to stop the pulls and hinder your jungler) when in fact most of your team is not going to be there anyway. The major downside to this strategy is that your trilane will usually end up underlevelled - all 3 of you will just be relying on lane creeps and hero kills in your hard lane, while if you were in your safelane you could pull and jungle more safely to supplement your income. On the other hand, ganking mid is much easier from the offlane due to more favourable terrain. This strategy usually results in shorter games, and is seen in very high skill pub games where one team ends up with a draft that cannot compete with the other in the lategame, so they try to force an early game win like this. This used to be the default pub line up many years ago but has fallen out of favour. Dual mid ensures that you shut down the enemy mid hero entirely and dominate the runes, while your safe lane is run solo as it has the advantage of terrain. Some hero drafts don’t have a natural midlaner and this might be the optimal laning choice for your team. The additional pressure your team puts on the enemy mid can hinder his gold and exp gain to the point he becomes irrelevant to the game. Some hero compositions force the team to run this role, for example when you need to gain levels on a critical support hero (like Wisp) and a normal trilane type composition will not make sense.